If you want a quick and easy start in computer-based recording you'll find it in this competitively-priced package. Good value. Easy way to get started. Decent headphones. You'll need a better microphone at some point. The nerve centre of the system is the AudioBox iTwo USB audio/MIDI interface, a 2in/2out unit which can record audio through a pair of combo inputs that can handle microphone, instrument or line level signals. "Buying separate items from various manufacturers will give you more choice but may cost you more headscratching and more money"
This easily connects to any computer via USB but also has a dedication iPad connection. Overall it performs well and provides all the features and connectivity any starting recordist (and many of those beyond beginner status) would need, including L and R outputs to connect to a monitoring system, headphone output and a useful mix knob to set the balance between the sound at the input and the playback sound, allowing latency-free monitoring. The HD7 headphones are comfortable and semi-closed, so are fine for recording next to a mic as well as extended general listening. 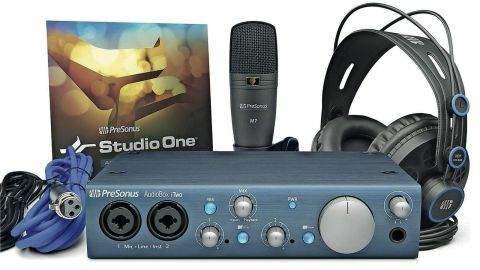 For iPad recording Presonus recommends its free Duo Capture stereo recording app, while on a computer you get its Studio One Artist digital audio workstation (DAW) software for Mac and Windows which offers more features than the basic free version including 28 plug-ins (as opposed to nine). With those, unlimited tracks and four included virtual instruments, there's certainly enough there to build up some quite decent productions without embarking on the upgrade path to the Producer and Professional versions. Buying separate items from various manufacturers will give you more choice but may cost you more headscratching and more money, so this represents a convenient starting point.